"Terrible things are happening in Goraya castle. Insane megalomaniac Gingrich Yurr is preparing to unleash an army of monstrous zombies upon the world. He must be stopped and his undead horde defeated. In this life-or-death adventure the decisions YOU make will decide the fate of the world. 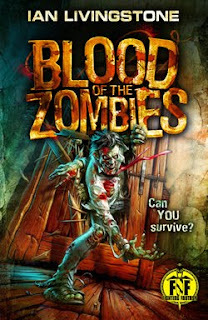 Can YOU survive or will YOU become a zombie too?" Released on August 2nd, it's going for a mere £4.71 ($7.30USD appx) on Amazon UK at this moment, and when compared to the RRP of £7.99 is a real bonus-bonanza-bargain. I can't find it on Amazon US tonight ... hmm ... maybe it's still too "hot off the press". I'll be really honest, I don't like zombies -not to mention that the world of entertainment being a bit overrun by them (there's a sort of play on words in there I think). Over the last couple of years, zombies have become a bit passée or over-ripe, even. It's the way traditional zombies limp about trying to give bad hugs (although I remember still feeling the fear during the slow reload in the earlier Resident Evil games). They are the tackiest of all the undead and the hardest to defend to concerned parents who would have be fobbed off in the past with the idea that Fantasy Fantasy books were somehow educational because you have to make choices, and besides, it's an actual dead-tree paper book. (Maybe there's a market in selling wireless xbox controllers which look like books?) So let's hope this is actually an okay gamebook and not just a zombie -Romero-revisionist-intellectually-lazy-but-perhaps-a-little-post-modern bandwagon gorefest which someone in marketing thought would be a good idea, now we've all got over Harry Potter. My copy has now arrived and already I'm in appreciation of the the super fast combat system which is nothing like normal Fighting Fantasy - which worried me originally to say the least (no Skill, no Luck). Basically Zombies are like "decrepit skeletons" in D&D4 they have 1 hp - so damage is effectively the mowing down of enemy troops depending on the die damage by the weapon you're using. An initial flip-through tells me that it is very much like Resident Evil with ammo and health packs but in a gothicky castle - contemporary horror- hells bells! There's a nice foreword by Mr. Livingstone explaining that he had started with fantasy but had a sudden rethink and set it in modern. Although we all know Ian Livingstone isn't shy when it comes to cashing in on a craze. ;) It's an FF shoot-em-up!